Experience tall buttes, vast mesas, deep canyons, rushing rivers and arid desert in southern Utah’s five national parks. In Canyonlands National Park, river meets desert, forming striking canyons and towering flat buttes and mesas. Explore all four districts of the park. Island in the Sky is a mesa, a large flat hill with steep sides falling 1,000 feet (300 meters) to the arid lands below. Reach the mesa by hiking, driving or bicycling across a narrow access path near the park’s northern entrance. Then travel along the mesa’s rim and stop for outstanding views at numerous pullouts. One popular site is Upheaval Dome, an unusual formation of rock pushed up in a circle and then warped down. Study the area to determine which theory of its formation you believe: salt bubble or meteorite impact crater. The Needles district presents the opposite perspective, looking up at towering pinnacles from valleys eroded through the region’s sandstone. Backpack or drive a four-wheel drive to visit some of the individual named features, including Elephant Hill and Tower Ruin. Venture to the Maze to experience very remote parts of the park. Travel here requires high-clearance four-wheel drive autos or self-sustained backpacking. Get a permit to camp for one or more nights to discover the area’s formations and appreciate its tranquility. Horseshoe Canyon has spring wildflowers and life-size rock art. Finally, explore the rivers. At the first part of its journey, the Colorado River is relatively narrow, but it has had the strength over many centuries to carve its way through layers of sandstone. Canoe or kayak down the canyons of the Colorado or Green rivers. The two rivers meet at the Confluence and merge to create world-class whitewater conditions down Cataract Canyon. Check river level and flow rate to ensure conditions are appropriate for your plans and skill level. Borrow a kids’ toolkit from the visitor center to help your children develop naturalist skills. They can earn Junior Ranger badges too. The park is under an hour’s drive from Arches National Park and Moab. Consider a multi-day trip to explore both parks. U.S. national parks offer beautiful views and affordable adventures for all travelers. Enjoy your trip to Canyonlands National Park. With one of the world’s largest concentrations of naturally formed stone arches, this park provides memorable scenery and prompts great photography. Walk with your family along a scenic path and examine Ute petroglyphs of sheep and horses on your way to this remarkable arch. Follow in the footsteps of Indiana Jones with a hike through this set of enormous red loops in a popular national park. Watch the spectacular sunrise under the frame of a low-sloping arch at the end of one of the state’s most popular trails. Look through the eye-like circular holes known as the Spectacles for a glimpse into the otherworldly realm of red arches. Arrive early at this natural window at the end of a trail for the views, the serenity and the idyllic sunrise. Watch the sun set beyond the silhouette of the longest of the many red loops that make up Arches National Park. Take photos of this rocky window that is one of the most prominent natural features in the park’s undulating red skyline. Named after New York’s famously swanky thoroughfare, this short and relatively easy trail is lined with striking skyscraper-like sandstone pinnacles and spires. 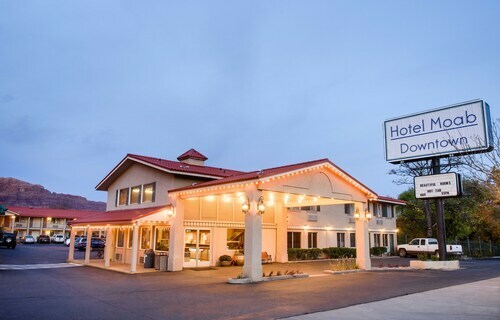 Situated near the airport, this hotel is within 3 mi (5 km) of Lions Park, Rotary Park, and Arches National Park. Tower of Babel and Balanced Rock are also within 16 mi (25 km). 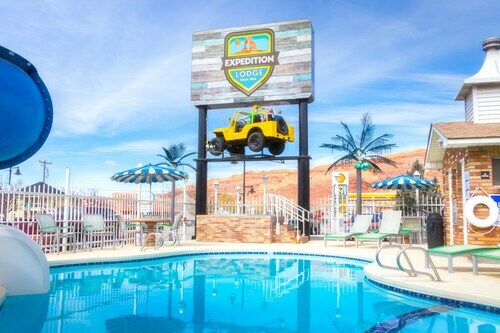 Located in the center of Moab, this family-friendly motel is within a 10-minute walk of Swanny City Park, Museum of Moab, and Moab Information Center. Grand County Civic Center and Amasa Back Trail are also within 1 mi (2 km). Situated in a rural location, this hotel is within 1 mi (2 km) of Moab Information Center, Museum of Moab, and Amasa Back Trail. Swanny City Park and Rotary Park are also within 2 mi (3 km). Situated in Moab, this motel is within a 10-minute walk of Moab Information Center and Museum of Moab. Swanny City Park and Grand County Civic Center are also within 1 mi (2 km). 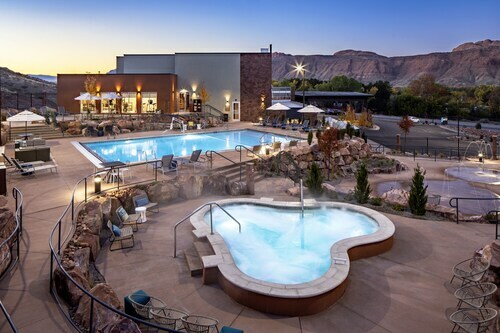 Located in the heart of Moab, this hotel is within a 5-minute walk of Moab Information Center and Swanny City Park. Museum of Moab and Grand County Civic Center are also within 1 mi (2 km). 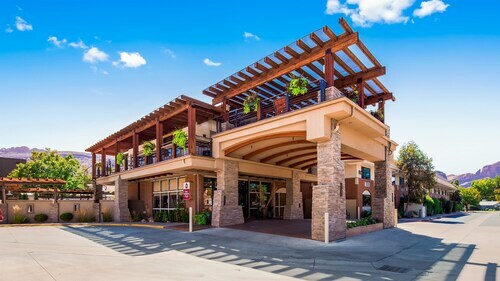 Situated on the riverwalk, this hotel is within 1 mi (2 km) of Lions Park and Arches National Park. Grand County Civic Center and Swanny City Park are also within 2 mi (3 km). Situated in Moab, this eco-friendly hotel is within a 5-minute walk of Moab Information Center and Museum of Moab. Swanny City Park and Grand County Civic Center are also within 15 minutes. 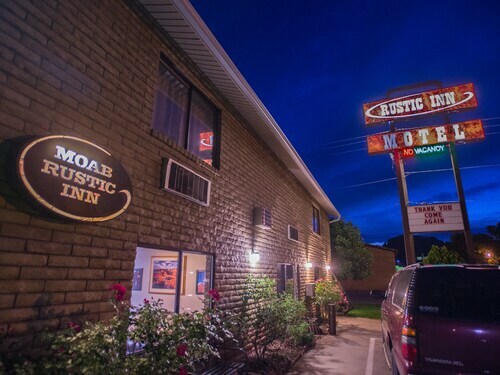 Situated near the boardwalk, this motel is within a 5-minute walk of Museum of Moab and Moab Information Center. Swanny City Park and Grand County Civic Center are also within 1 mi (2 km).